From top to bottom: The Many Faces of Aaron Vanek: saloon owner in a Deadwood LARP, F. Scott Fitzgerald during a Speakeasy poker game LARP and the Bloody Baron, house ghost of Slytherin at a Hogwarts LARP. Photos courtesy Aaron Vanek. John Behnken is 47 years old. He works for IBM as a security architect, was a chef after graduating from the Culinary Institute of America and has a family of four. He lives most days as an average Joe, but other days he is John the wizard, John the combat fighter or John the game master. 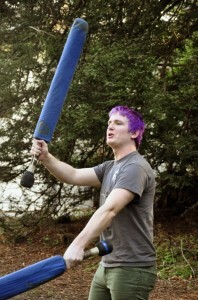 Behnken now runs a LARP game in Massachusetts, called Prophecy. LARP stands for “live-action role-play,” and is a game, or — as some argue, a form of art — that is comparable to an extremely immersive form of improvisational interactive theater. The spectrum of types varies from episodical five- to six-hour LARPing games to ones that last for years and participants return to the same background story with their same characters. Sometimes games involve a few participants, but often they have hundreds. Around the world, there are hundreds of thousands of people involved in LARPing, yet most “regulars” don’t have a clue what the word means. Among people who do recognize the word, LARPing is often considered the ultimate geeky pastime. Some dub the game the ultimate form of escapism. Either way, it’s role-play, and everyone has some way of finding an alternative for reality. LARPing is just a more fantastical one. At UC Santa Cruz, the closest activity to LARPing is the internationally recognized game Belegarth. In this sport, students focuses on the battling aspect of the game. LARP designer and creator Aaron Vanek, a UCLA graduate, said there are three main features to look for to identifying a LARP experience. First, there is a lack of audience, because the people involved participate and no one watches. Second, LARPers act out everything instead of narrating actions, like in Dungeons & Dragons. Third, there is what he calls identifying the “bubble.” The bubble is the boundary that expresses the end of the real world and the start of the world in which the player is role-playing. So where does the appeal to be in this “room-turned-spaceship,” or in a forest reenacting a medieval combat, come from? When the players really get involved and become part of the story, things happen, John Behnken said. 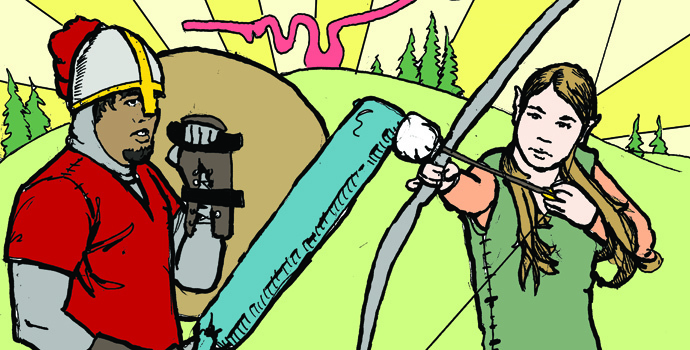 With its extremely wide spectrum of varieties and types, the history of LARPing is complex. Vanek said that role-playing has been around since the beginning of time. 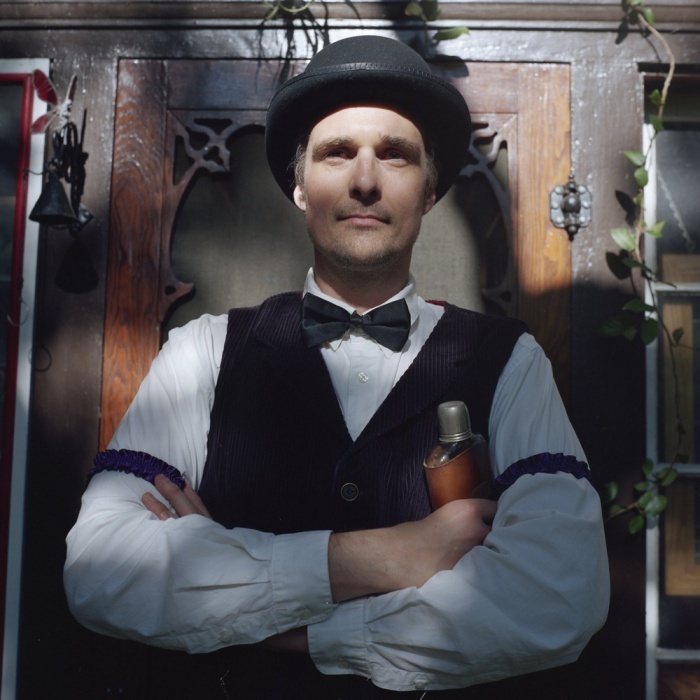 Rick McCoy is the president of LARP Alliance, a southern California–based group that brings together LARPers by developing resources for players. McCoy said that in order to be identified as a LARPer, mechanics and rules must be involved. Either way, putting the focus on role-playing aside, modern day LARPing has an intricate history. In 1976, Gary Gygax and Dave Arneson, both game designers, created Dungeons & Dragons, a role-playing game that is tabletop-based like board games. Gygax was largely inspired by “Little Wars,” a simulation-type war game that incorporated miniature armor, created in the early 20th century by author H.G. Wells. Arneson and Gygax took this concept and added fantasy elements and complex story lines to it. Participants embody characters instead of military formations, and go on adventures in a previously set fantasy world. Each game has a game master, or dungeon master, who not only creates this imaginary world but also acts as problem solver in it. Dungeons & Dragons was the first fantasy-based game to become popular, luring in nerdy high school students all over the country. In 1981, Larry Niven and Steven Barnes, both authors, wrote the fantasy novel “Dream Park,” describing a theme park setting with highly futuristic elements. In “Dream Park,” the International Fantasy Gaming Society (IFGS) is a worldwide organization of fantasy gamers. Niven and Barnes took the tabletop phenomenon of Dungeons & Dragons and practically predicted what could happen if players were to make the role-playing live action. The novel’s IFGS was recognized by real-life fantasy gamers, and later that year a real-life IFGS was established into a team of adventurers — Think “Lord of the Rings” — with a common goal. This is what could be called the first official LARP society. Many Dungeons & Dragons fans were excited by this and delved into the LARPing world. 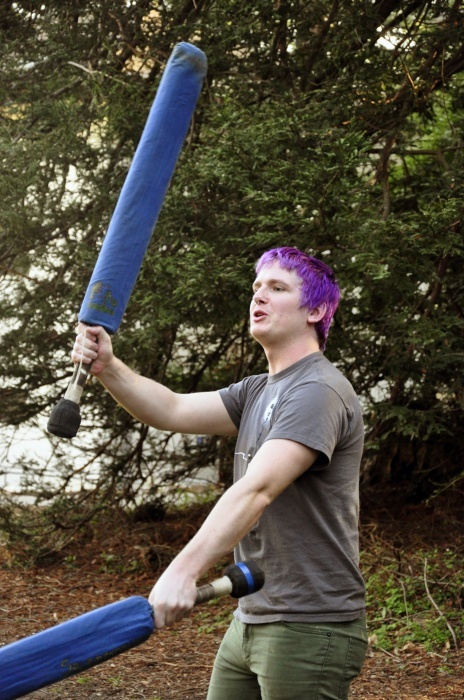 Third-year Sam Sanders participates on campus in the foam weapon combat game of Belegarth. Photo by Kyan Mahzouf. LARPing takes on infinite realizations. From live combat games to mystical adventures, from embodying medieval villages to a LARP based on a futuristic idea, like “The Matrix.” The list is never-ending, but all have one thing in common: role-play that is active, or live action. So where does the desire come from to develop a character that is so far outside of yourself? After all, even children play games like cops and robbers and have tea parties with stuffed animals. UC Santa Cruz sociology professor Craig Reinarman explained the attraction of acting out of character. Some LARPers see the game as not only a hobby but as a form of escapism. Rick McCoy, for example, said that as a child he read books constantly. Instead of escape, the game can also be seen as a form of control, of building a character up from the ground in whichever way the player desires. “I think it’s a way of controlling your own person, controlling your own destiny despite what life has thrown at you,” Andrew “Sieglatan” Hodnet said. Hodnet is the organizer of a Belegarth group on campus, a live combat–based game that is less intense in terms of role-playing. “A lot of these people want to be in a setting where by the merits of their own strength and the merits of their own bravado they are the leader of their own little hill,” Hodnet said. Although control and escape may be two reasons behind LARPing, players can also learn from role-playing. Brandon Boucher, also known the “lightning bolt man,” made a LARPing video on YouTube that skyrocketed to popularity. Boucher is now featured on “TOSH.0,” a U.S. television series in which host Daniel Tosh provides sarcastic commentary on popular culture. Boucher said that LARPing is an enriching experience, as it can be both physically challenging and an emotional work-out. On a grander scale, role-playing is also a learning experience. In sociology and psychology, as Craig Reinarman explained, role-playing can be a kind of exercise to understand more about what the world looks like from the point of view of another person. “This comes from a particular tradition in sociology that is called symbolic interactions,” Reinarman said. “It’s a certain way of conceptualizing the self: learning who you are largely through watching the responses of other people. 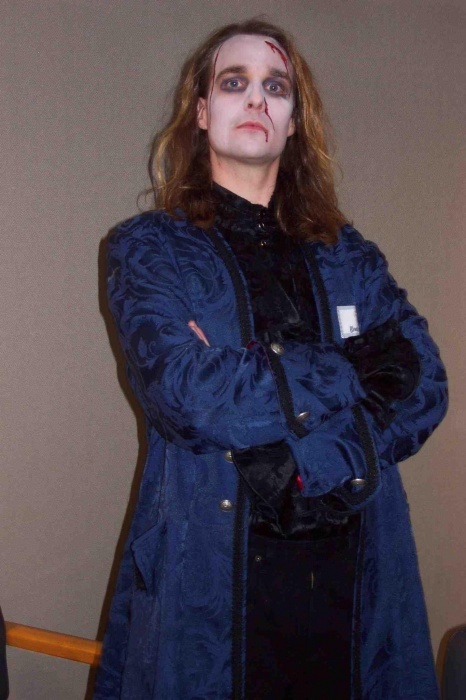 Aaron Vanek, LARP designer of many long- and short-term events, said that role-playing has been around as long as humanity has existed, and that it is hard-wired into our brains. He makes the comparison to ancient holidays such as the Roman Saturnalia, when, for a day, masters and slaves would switch roles. What sometimes can be mistaken as truly immersing oneself in a role can also be seen as taking a role too far. This is exactly why a LARP environment is a controlled one, with boundaries, McCoy said. Part of the art of LARPing is to be able to identify these boundaries. The amount of preparation that goes into a LARP, especially a long-running game, is immense. The best LARP designers take their craft seriously. Writing the story, the backbone for a LARP and preparing the locations, props and costumes can take months. John Behnken, who runs Prophecy, describes the complexities of setting up a serious game. 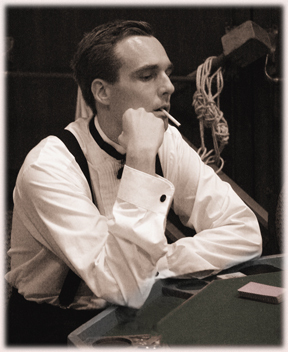 This extent of preparation can be comparable to endless rehearsing for plays or dance performances. A big difference is obviously the lack of audience, and the extreme involvement of all who are a part of the game. The reason why LARPing may be recognized as a geek game rather than a powerful medium of expression could be the fact that it is such an internal experience. There are no spectators, there are no observers and there is no one to take an outsider’s perspective, except for maybe a journalist or two trying to do their readers a service by explaining what LARPing is all about. Some, such as Brandon “lighting bolt man” Boucher, believe that LARPing will never become mainstream, that it is so far outside normal that it will not reach that point. But LARP is making huge strides in the community at large. 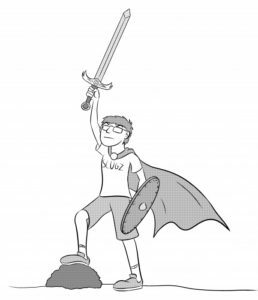 Vanek predicts that LARPing is on its way to recognition and in the future will be portrayed as a viable hobby and art form, rather than a gathering of turbo geeks.